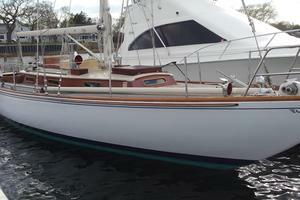 “Rejoice” is truly a one of a kind Morris 42 Ocean Series. She was designed by Chuck Paine and Morris Yachts, a collaboration that led the Morris 42 to win the Cruising World Overall Domestic Boat of the Year in 2005. 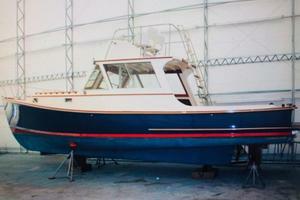 “Rejoice” was the last Ocean Series 42 built and is in excellent condition. The Ocean Series combines strong, safe, offshore voyaging characteristics with comfortable live-aboard space and an ease of handling for short-handed sailing. 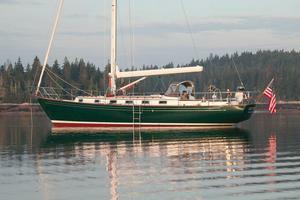 She also has a shallow draft allowing for flexible cruising and anchoring options. “Rejoice” is a two cabin, one head layout that was built for a repeat Morris owner to cruise and day sail and is well equipped with all the sailing gear you’ll need. Consistently cared for by the highly professional crew at Morris Yacht’s Northeast Harbor Yard. Currently in heated indoor storage and ready to splash and sail away! Please call or email to schedule an appointment to view. LESS THAN 500 ENGINE HOURS! 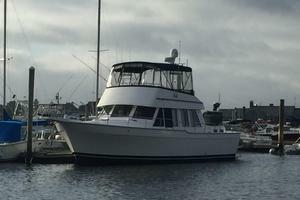 Restless is a 2004 Mainship 430 Trawler, Aft Cabin. Two Stateroom, Galley Down Version. The 430 Aft Cabin has wonderful space, storage and a great layout. She features two huge private berths with full heads and separate showers. The twin 350Hp diesel cats have less than 500 hours on them and the 8Kw diesel generator hasless than 300 hours! The 3 Zone AC/Heat, Full Galley with propane stove top and oven, fresh water heads, entertainment systems and incredible views from the flybridge should put Restless at the top of your list of boats to see! Check out Full Specs for more details! This Hinckley 41’ Cutter, WRAITH, offers the unique opportunity to own a classic yacht with one of the best builder’s pedigree known, proven experience competing on the classic yacht circuit and ownership that has shown the dedication and commitment to maintain the yacht at the highest level. Built in 1955, her hull is double planked mahogany over white oak frames and her decks are traditionally laid teak decks over plywood sub-deck. From the time period of 2004-2006 she underwent a major restoration that saw the replacement of all her underwater hull with an inner layer of Okume plywood and an outer layer of Philippine Mahogany. During this time, 50 of her oak frames were either replaced or sistered. Her structural bronze fasteners, including the ballast bolts, wooden floor bolts and plank fastenings were replaced. During the current owner’s stewardship, the yacht has not only been maintained to the highest standards but many of her systems have been upgraded and improved and her sail inventory has been updated with a new suit of classically narrow paneled sails. WRAITH has been immaculately cared for and is set up for both single handed sailing as well as competing on the classic yacht series; successfully competed in the famed Opera House Cup, Herreshoff Classic Yacht Regatta and Newport Classic Yacht Regatta. She is truly a remarkable yacht. Anthem is a true New England Classic, a very rare flybridge version of the immensely popular 32′ Wasque (pronounced Way-squee) built by David Thompson of Martha’s Vineyard Yachts. She’s been the recipient of true pride of ownership over the years, stored indoors in the Winter for most of her life, with continued updates and improvements. She features a ‘Aristo Blue’ hull color by AwlGrip, and off-white top decks, and a white canvas enclosure for the lower helm deck. Anthem is powered by her Perkins 6-354T diesel engine, which is turbo-charged and fresh water cooled, and low original hours, and she can be run from her flybridge helm or the lower station, both with rebuilt steering pumps. Down below, she has an enclosed head and vanity with shower head faucet. Galley with Corian countertop, two-burner LP gas cooktop, deep ice box and stainless steel sink with both 12v water pump and original hand pump faucet and recent 6 gallon hot water tank. Forward v-berth provides comfort for overnight stays or extended cruises.